Every summer we spend a couple of weeks back home on the family farm, Dan-D Farms. My parents are farmers and raise cattle, field corn, soybeans, alfalfa and sweet corn. They also operate a corn maze. 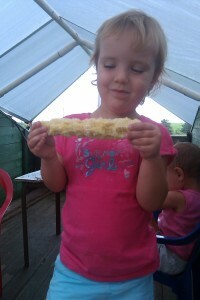 Our girls look forward to picking sweet corn and working the corn stand; selling sweet corn by the dozen. It’s a special treat to Dan-D Farms’ customers when a little girl helps bag up the corn and puts a smile with a thank you. 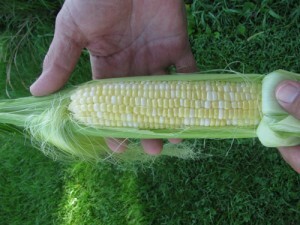 Dad has been growing sweet corn for decades and has it mastered. His sweet corn is picked fresh every morning as the sun rises and most of us are still cuddled up in bed. For two months out of the year, Dan-D Farms loyal customers flock to the corn stand and exclaim that it’s the world’s best sweet corn. I tend to agree! I spent some time in the corn field and asked him a couple of questions. Here’s a clip of our discussion.